Established and well-diversified platform, with a track-record of growing DPU. Singapore Industrial rents expected to bottom by 2018. Initiate coverage with Accumulate rating and $2.86 target price. We like Ascendas Real Estate Investment Trust (A-REIT) for its track record of growing YoY distributions to Unitholders, active capital recycling, repositioning of portfolio mix and stability through its well-diversified portfolio. Our dividend discount model (DDM) valuation represents an implied 1.35x multiple over FY18e net-asset-value. Established platform with support from Sponsor to deliver consistent returns. 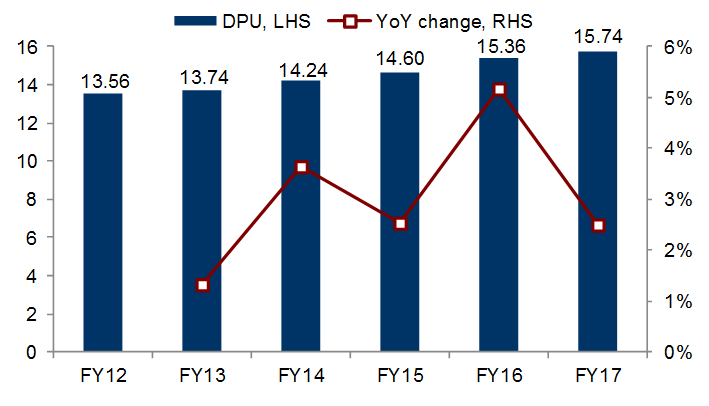 Distribution per Unit (DPU) has grown at a 3.0% CAGR over the last five years. We expect DPU growth to be sustainable, through prudent management of the portfolio and capital. Stability through diversification of the portfolio. Portfolio of 131 properties as at end-March 2017 is diversified across property type, geography, lease structures and tenant trade sectors. No single property accounts for more than 5.4% of gross revenue. The trust also boasts a diverse source of capital. Growth through rebalancing of the portfolio. Singapore portfolio is under continual rebalancing, gearing towards higher-value added manufacturing. Australia platform continues to expand, while the China portfolio was divested in FY17. Largest Industrial REIT with an improving outlook for Industrial rents. Oversupply of Industrial space is a concern, but supply is tapering in 2018. Taking the tapering supply in context with the uptick in Industrial activity leads us to believe that rents to bottom by 2018. A ready pipeline of Industrial space from Sponsor. A-REIT’s Sponsor does not grant a right of first refusal (ROFR) portfolio. Nonetheless, A-REIT has access to the Sponsor’s pipeline of over S$1 billion of Business & Science Park properties in Singapore. Sizeable Australian platform, tapping on favourable outlook. Australia is expected to experience positive gross domestic product (GDP) growth in 2017. Outlook is robust for leasing demand of industrial properties in Sydney and Melbourne, underpinned by population growth and retail trade. 76% of the Australia platform by valuation is located in Sydney and Melbourne. Relatively low gearing affords debt headroom for inorganic growth. A-REIT’s 3.0% cost of debt is lower than median of 3.4% among peers as at end-March 2017. Aggregate leverage of 33.8% affords ample debt headroom to grow the portfolio by 20%. Attractive distribution yield. A-REIT offers an attractive FY18e forward dividend yield of about 6.1%. Protracted uncertainty in business sentiment. Cautious outlook from tenants and reluctance to renew leases or expand would result in muted demand for space and put pressure on rent. Disorderly interest rate hikes. A faster than expected hike in interest rates would put pressure on cost of debt and negatively impact income available for distribution. Australia portfolio faces two key risks. Unfavourable changes to the withholding tax regime and concentration in Logistics & Distribution facilities. HSBC Institutional Trust Services (Singapore) Limited is the Trustee. The property portfolio is held in a trust by the Trustee. The Trustee is responsible for the safe custody of the assets on behalf of Unitholders. Singapore portfolio valued at S$8.57 billion as at end-March 2017 consists of 03 million sq m of lettable area. The portfolio of 103 properties is diversified across five property types: (1.) Business & Science park properties, (2.) Integrated development, amenities & retail properties (IDAR), (3.) Hi-specification industrial properties & data centres, (4) Light industrial properties & flatted factories and (5.) Logistics & Distribution centres. 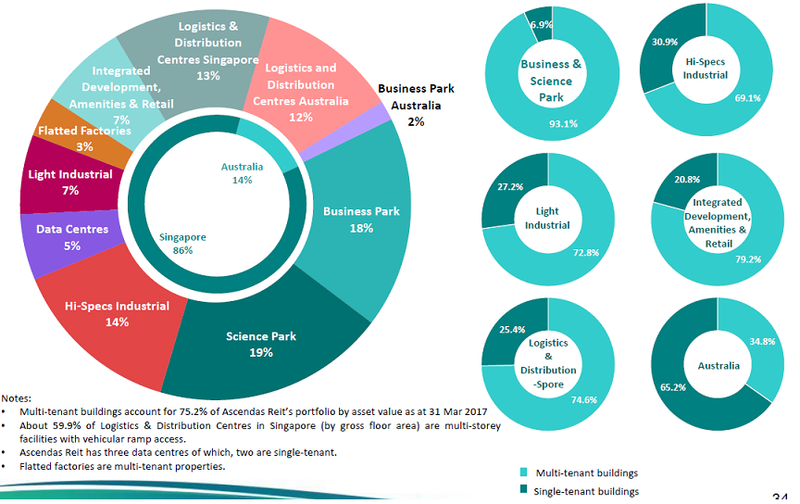 Australia portfolio valued at S$1.31 billion as at end-March 2017 consists of 692,000 sq m of lettable area. The portfolio holds 27 Logistics & Distribution centres and one Business Park property. We view A-REIT as an established platform that has delivered growth through active portfolio rebalancing and achieved stability through portfolio diversification. DPU has grown at a 3.0% CAGR over the last five years, from 13.6 cents in FY12 to 15.7 cents in FY17. 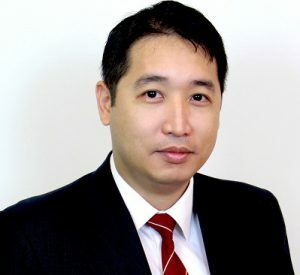 A-REIT has rebalanced its geographical footprint by gaining a foothold in Australia and exiting from China. The portfolio remains diversified across asset type, lease structure and tenant trade sector. The portfolio is currently split between Singapore and Australia. Singapore remains the home base, while the Australia assets make up 14% of total portfolio value. Australia is attractive for its freehold land status and market transparency. A-REIT had divested its three China properties during FY17. The Singapore portfolio is diversified across the five property types of: (1.) Business and Science Park properties, (2.) Integrated development, amenities & retail (IDAR) properties, (3.) High-specifications industrial properties and data centres, (4.) Light industrial properties and flatted factories, and lastly, (5.) Logistics & Distribution centres. The Australia portfolio consists of only Logistics & Distribution centres and one Business park property. Singapore portfolio is dominated by Multi-tenanted buildings (MTBs) and diversified across five property types. Australia portfolio is dominated by Single-user assets (SUAs) and diversified across two property types. A-REIT has 131 properties in its portfolio as at end-March 2017. The largest contribution to the portfolio’s monthly gross revenue from any property is 5.4%. Consequently, A-REIT is not heavily dependent on the income from any single property in its portfolio. The largest contribution to gross revenue is attributable to the property located at 8, 10, 12 Kallang Avenue known as Aperia. Aperia is an Integrated development, amenities & retail (IDAR) property consisting of two Business towers connected to a three-storey Retail mall. A-REIT’s tenants span across more than 20 trade sectors. A-REIT’s portfolio does not have a majority exposure to any particular trade sector. The largest exposure comes from the third-party logistics (3PL) and freight forwarding segment, accounting for 10.6% of monthly gross revenue. 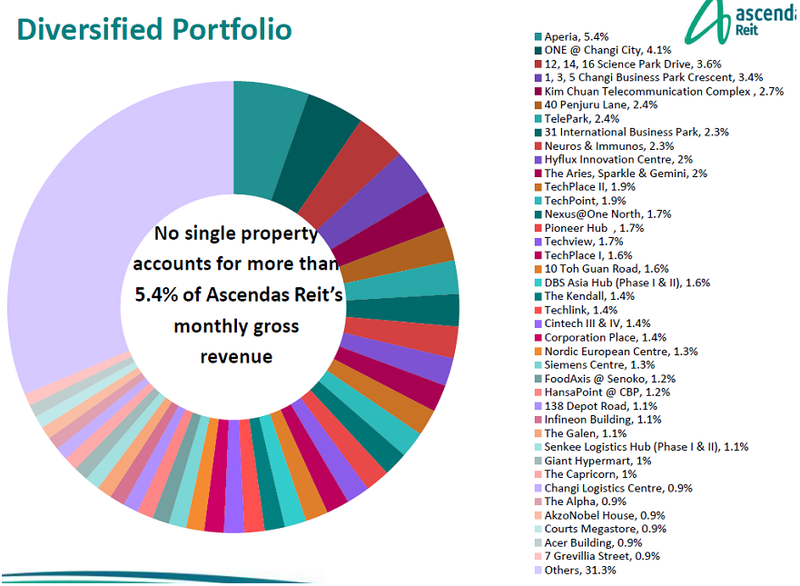 At the same time, A-REIT’s 10 largest tenants account for 20.8% of portfolio gross revenue, with Singapore Telecommunications Ltd being the largest at 4.8%. Consequently, A-REIT’s portfolio experiences low single-customer concentration risk.